On the 16th March the BCKA travelled up to Huddersfield to take part in the Clash of the Titans capping off a busy competitive start to 2013. 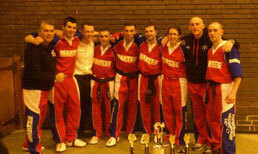 The best martial arts fighters across the UK were on show at this event including nine of our own. The BCKA entered a team into the junior event comprising of Lewis Gemmill, Nikolai Milanov, Daniel Laing, Kieren Wilson and Jack Bristowe. The boys took on Colne Valley Black Belt Academy and in a thrilling encounter with numerous twists and turns came out victorious as Clash Champions truly announcing themselves as top class talents. 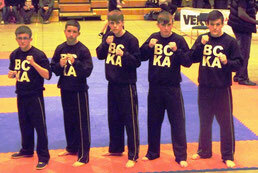 For the adult event the BCKA teamed up with fighters from Chris Boughey's NWCKB to form Chinese Kickboxing Select. Jo Redman represented in the women's event matched against and defeating a tae kwon do world champion from Team TKD. Alex Barrowman, Kevin Williams and Jamie Key alongside Elliot Moore and Mike Eade of NWCKB starred in the men's event. The lads smashed their way through and demolished teams from Colne Valley Black Belt Academy and Team TKD with some inspiring performances putting themselves into the final against Mushin Kai. 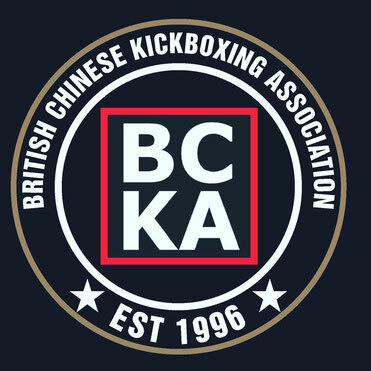 After what can only be described as an epic contest with great fighting from both teams the Chinese Kickboxing Select came out as valiant runner ups with BCKA's Alex Barrowman awarded with Fighter of the Night. Well done to all our fighters in what was a truly fantastic night of fighting and doing the association proud. Thanks to all our supporters from the BCKA and our friends at the NWCKB for adding to the atmosphere and getting behind the fighters. Special mention also to the coaches on the night - Alex Barrowman, Chris Boughey, Joe Tierney and Rick Allsop.